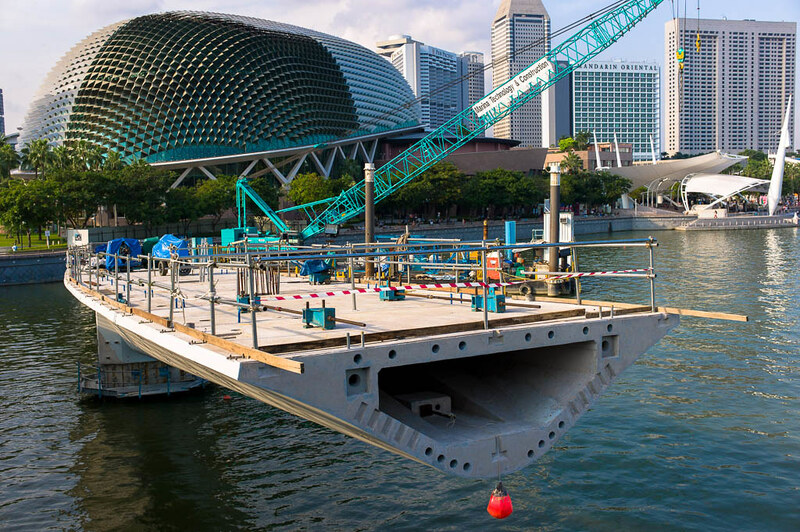 Look, a Whale leaping out of the waters over Marina Bay Sands? Sometimes, when you go out for a walk without any preconceived ideas or notions of what you will do, or what you will see, the heavens rewards you amply with the most serendipitous of moments – such was a day last Sunday when I took a walk along Marina Bay, despite the sweltering heat and high humidity so typical of a tropical country like Singapore. 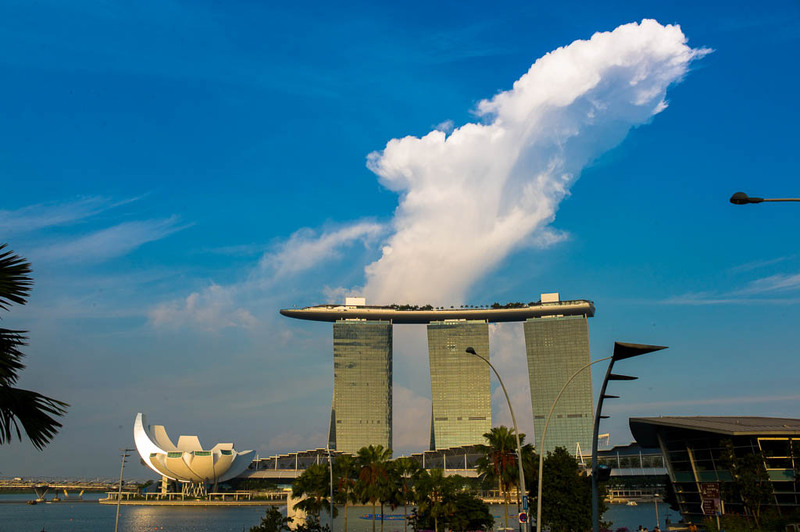 This huge “whale” of a cloud soared over the towers of Marina Bay Sands, looking as if it had just leaped through the waters of the sea and into the air, stealing a glance at this island which had changed beyond recognition over the years. It was the light that had first drawn me that Sunday after church, the deep blue skies and golden light beckoning me to brave the 30 degree heat. And in a way, I needed that walk – I needed to be alone, and what better way to indulge in some “me” time than to pick up my Leica, and witness the gifts that life sometimes hand out – the little moments often gone unnoticed, the places that were taken for granted. Like for example, this group of dancers practising out in the open. 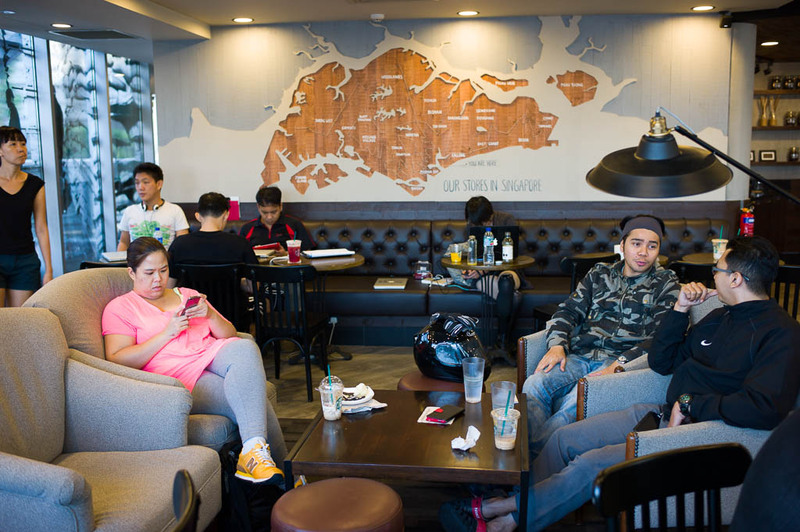 I also had the opportunity to discover Starbucks’s 100th store in Singapore, opened on the 14th of February 2014, now occupying the elegant Fullerton WaterBoat House – a landmark store fittingly located near the mouth of the Singapore River, where merchant ships and boats used to ply years ago, bringing trade and commerce into Singapore. Not quite sure what this counter is for in this huge Starbucks – this one is different from the main one near the entrance where one places orders and collects drinks. Featuring 3 bar counters, a huge spacious interior with glass windows offering great views of Esplanade bridge, and Marina Bay Sands, this latest Starbucks is a great place to relax after walking around the surrounds of Marina Bay – though it is the second major Starbucks located in the area, the other being the one at One Fullerton. 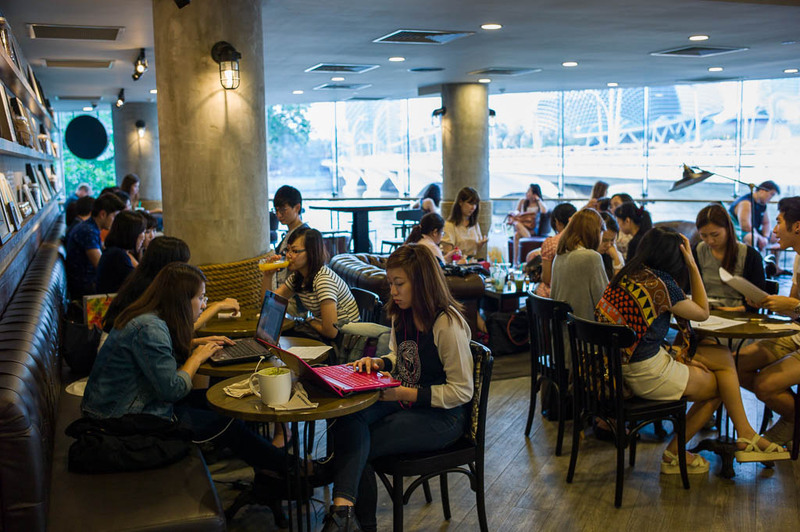 Students studying in Starbucks is a common sight, even in Starbucks in Japan. Here at Starbucks’ 100th store, there is a lot more space for that! 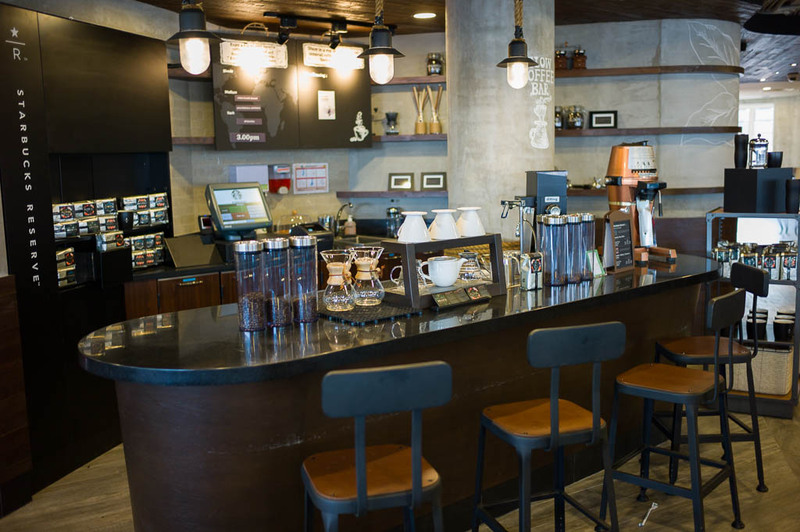 Inside Starbucks’ 100th store at Fullerton Waterboat House – this place is huge! 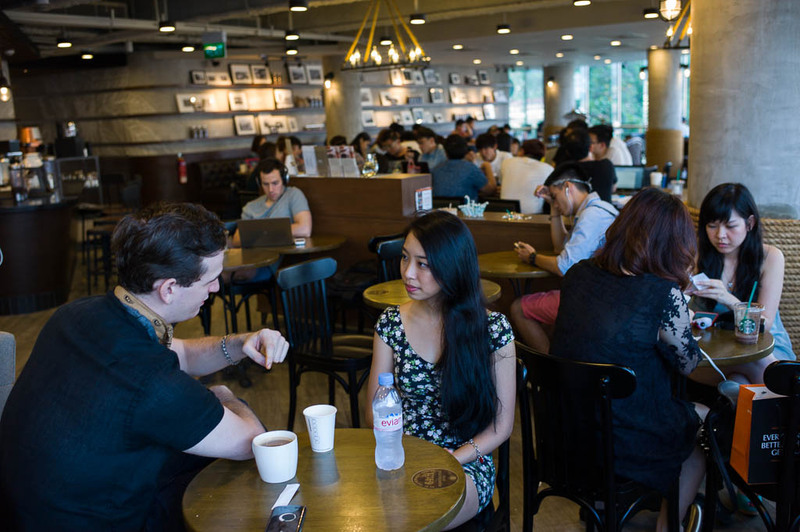 The 100th Starbucks store also gives back to the community by hiring barristers with autism – it is the community spirit of inclusiveness and the idea of a shared space – the “third place” concept of Starbucks (after home and office) which made me love going to Starbucks – for me it’s not about the coffee at all, but the place. 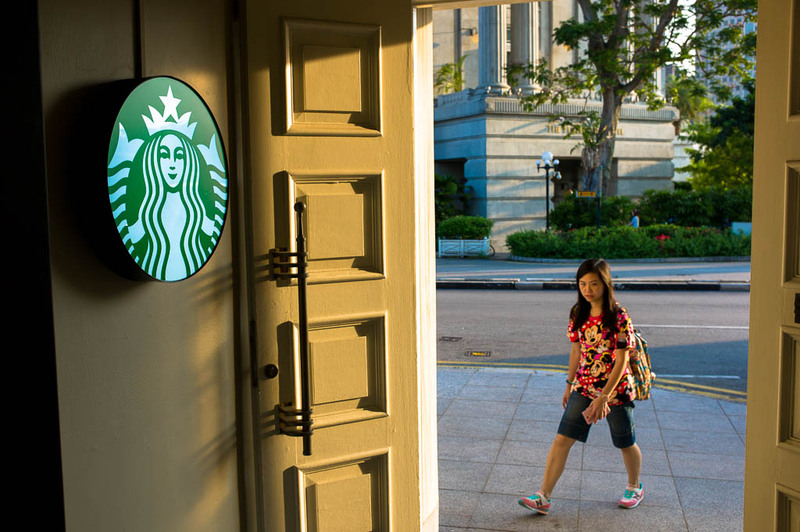 The 100th store features historical references throughout the place, such as depiction of Samsui women, the women from China who helped build the backbone of Singapore, carrying cargo to and from boats coming into the harbour along Singapore River. 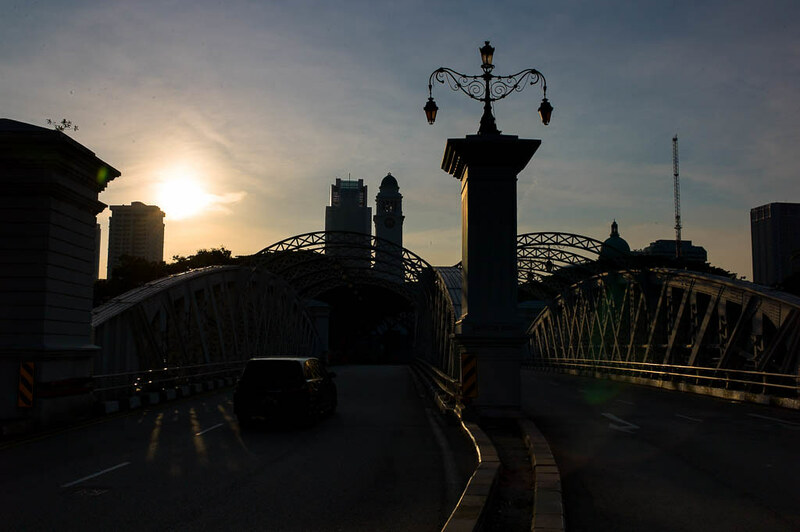 It also features nostalgic photographs of old Singapore. 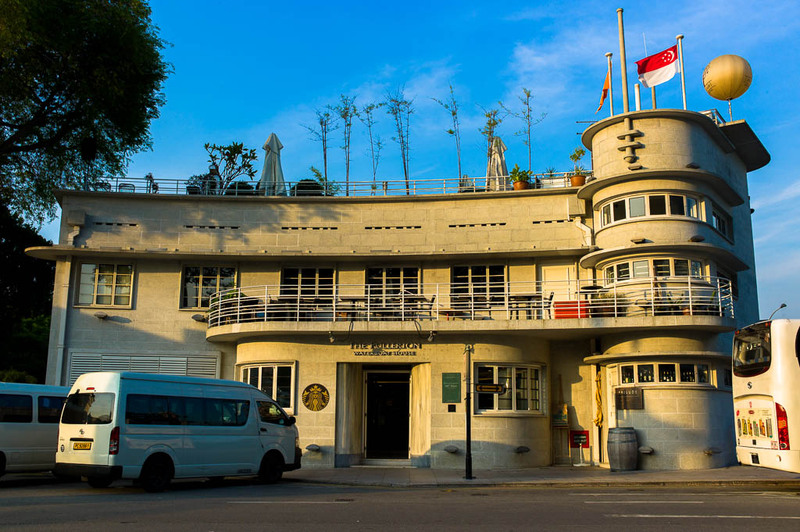 Walking into the Fullerton Waterboat house Starbucks is walking into a piece of Singapore’s history. The 100th store features historical references throughout the place, such as this depiction of Samsui women, the women from China who helped build the backbone of Singapore, carrying cargo to and from boats coming into the harbour along Singapore River. 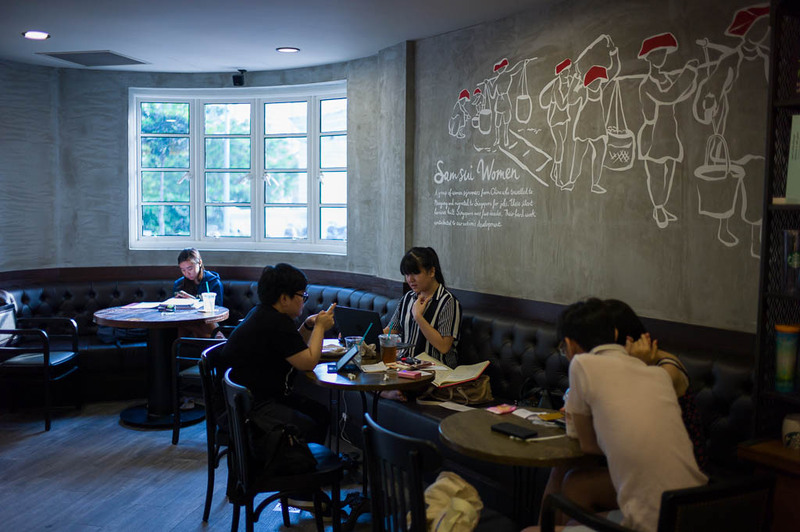 A couple chilling out on a Sunday afternoon at Starbucks’ 100th store in Singapore. You can see photos of old SIngapore on the wall in the background. I walked out of Starbucks after a short break into even more glorious light, and walking back towards Raffles place as I prepared to call it a day and look for dinner, I was rewarded with this fascinating scene of Acro Yoga practitioners – I had to ask the internet for the name of this activity! And that’s how a walk with my camera on a lazy Sunday turned out to be a fruitful photography trip!